Powerful, graceful and supremely adaptable, the mountain lion - or, cougar, panther, puma, catamount or painter - laid claim to a range that encompassed most of the New World, from the snowy fields of the Yukon to the forested coastal mountains of Tierra del Fuego and from the shores of the Pacific Ocean to the shores of the Atlantic. It occupied more territory and more environmental niches than any other land mammal (other than the Homo sapien) in the Western Hemisphere. Remarkably, in spite of relentless human intrusion, the mountain lion has retained much of its original distribution throughout the New World, although by 1900, it had been hunted almost into extinction in the eastern United States. A century later, it had begun to return to the eastern states, drawn primarily by the burgeoning white-tailed deer population. The mountain lion - a solitary, nocturnal animal - may stake out a range of several dozen square miles, with the size of its area defined largely by the abundance of prey. Typically, the male, declaring his ownership by scents, refuses to share his range with other males. A female may share her range with other females, and she selects a range based, not only on the basis of prey availability, but also on proximity to male ranges and opportunities for mating. The mountain lion tends to use a core area for birthing and resting and an extended area for hunting. The mountain lion may select a range located anywhere from the shore of the sea up to the higher elevations of mountain slopes, reaching up to elevations up to 11,000 feet in California and as high as 15,000 feet in Ecuador, according to Walker's Mammals of the World. It may migrate up into the higher elevations in the summer and down into lower elevations in winter. Except for females with kittens, the mountain lion shelters, not in a fixed den, but rather in crevices, caves and dense brush. According to the Oregon Department of Fish and Wildlife Internet site, they have been found living in populated areas, in drainage ditches and culverts. 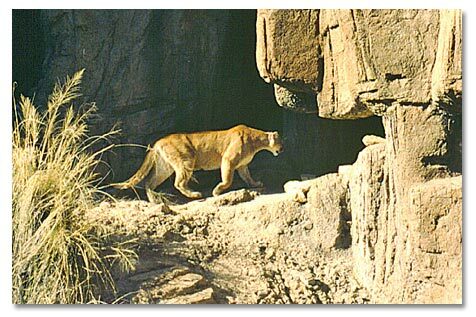 The mountain lion is so adaptable that it may thrive, said the Our Lands and Their Creatures Internet site, in habitats varying from "lowland tropical forests, swamps, and grassland, to mountain conifer forests, desert scrub, and any location with adequate cover and prey." As a stalk-and-ambush predator, the mountain lion, according to the U. S. Department of Agriculture Internet site, prefers densely forested areas in coastal swamps such as those of southern Florida, and it tends to choose vegetated ridges, rocky cliffs and ledges, and other solid covers in inland areas such as those of the Southwest desert basin and mountain range country. The mountain lion hunts by stalking and ambushing, often pouncing on its prey from an elevated vantage point or running it down with a burst of speed. If possible, it attacks the back of its prey, crushing the neck with its teeth. It uses its large front paws and heavy claws to clutch its prey. Usually, according to the U. S. Department of Agriculture paper, "Managing Mountain Lion Problems," the mountain lion removes its prey's viscera and eats the heart, liver and lungs first. In the United States, the mountain lion often favors white tail and mule deer, but it will prey on any animal it can catch, including anything from elk, moose and bighorn sheep to rodents, reptiles and birds. Some even eat insects. Typically, the mountain lion caches its larger kills, secreting them in secluded spots and covering them with leaves and branches. It returns to feed from its kill for several days. On average, it may kill a larger animal once a week. A female with kittens to feed may kill more frequently. An adult mountain lion eats 8 to 10 pounds of meat a day, according to a fact sheet prepared by T. R. Mader, Research Director, Abundant Wildlife Society of North America. Mature, healthy mountain lions run little risk of predation (other than by human hunters), but the young or sick may be attacked by wolf packs, bears or even other mountain lions. The male mountain lion reaches sexual maturity at about three years of age, the female, at about two and a half years of age, according to Walker's Mammals of the World. The mountain lion has no specific breeding season, but in the United States, it often mates in the late fall or early winter. The male returns to his solitary ways. The female gives birth to one to six - commonly three or four - spotted, blind kittens about three months later, typically in a den located in a dense thicket or beneath a fallen log. She nurses her brood for about three months, introducing the kittens to meat after their first month and a half. She teaches them to hunt when they reach about six months of age, when they take on their adult colors. She may tutor them in the art of the kill for perhaps another year, when they will leave her side to face the hazards of establishing their own territories. She will take her rest from rearing mountain lions for perhaps a year. With luck, a mountain lion may live in the wild for 8 to 10 years. It might live in captivity for 20 years. The mountain lion can run approximately 35 miles for hour for short distances. 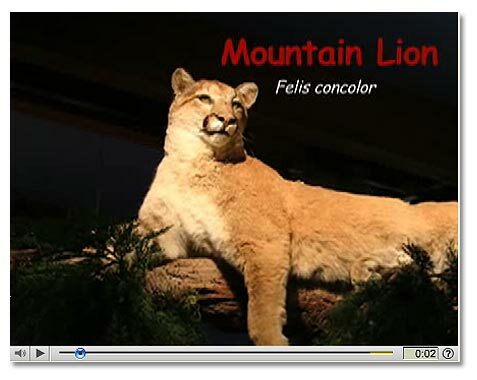 The mountain lion holds the Guinness record for the animals with the highest number of names. In the English language the mountain lion has more than 40 names.